Well we all survived the holiday season! It’s time to dust off our resolutions and start fresh. Merry has been creating new projects almost daily. Come on in and be inspired! There is still time to sign up for “Quilt Week” in Paducah, KY. The bus will leave Merry’s on April 26 at 8 a.m. and return in the evening on April 29. The cost is $625 per person with a $200 deposit due at registration. The remaining balance is due March 1. The cost includes transportation, three nights lodging, Quilt Festival admission, Quilt Museum admission and six meals. Call the shop to sign up today! 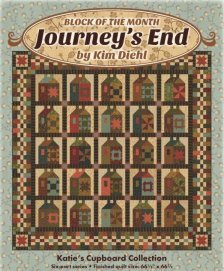 The new Kim Diehl line has arrived and with it came eight new patterns as part of “Simple Whatnots 6”. The cost is $52 per month. Plus FREE shipping! Give us a call to sign up! 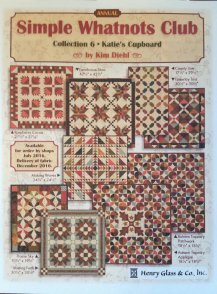 Kim Diehl's new line "Katie's Cupboard" is also part of the new Block of the Month. This series lasts eight months and costs $27.50 per month. New creations from Patch Abilities are coming! Sign up for the new series of monthly minis today!